Thronebreaker: The Witcher Tales is an adventure game with RPG and card game features. 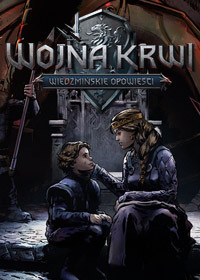 It takes place in The Witcher saga universe that was created by Andrzej Sapkowski and expanded by the developers from CD Projekt RED (the creators of the game adaptations of the books). Thronebreaker: The Witcher Tales began its life as a singleplayer campaign for the online card game Gwent: The Witcher Card Game. It was announced in 2017, but one year later the developers decided to release it as a stand-alone product. Thronebreaker: The Witcher Tales takes place before the events depicted in the games developed by CD Project RED. The main protagonist is Meve, the queen of Lyria and Rivia. During the game, the players can witness her actions during the second war with Nilfgaard. The players can also meet a variety of non-playable characters and make decisions that will impact the story and its finale. In Thronebreaker: The Witcher Tales, the players are traveling through a world map shown from an isometric perspective. There, they encounter new characters, participate in duels (they take the shape of Gwent matches), and complete side and main quests. While exploring the map and completing quests, the players are obtaining unique items and new cards that can be added to their decks. Resources that can be used in special camps are gathered as well. With them, the players can construct new buildings, recruit units and equip the main protagonist with new weapons. Potential soldiers can be also recruited during the missions and by making specific choices in the dialogues. Thronebreaker: The Witcher Tales features two-dimensional graphics with a strong comics-like style. A large part of the dialogues was dubbed by actors. The developers also created animated cutscenes. Thronebreaker The Witcher Tales guide contains a comprehensive collection of tips and a walkthrough to this advanced hybrid of strategy / card game. We explain how to explore the map, collect resources, expand the camp, use all units and win the battles.